The CM was on board a train on the Southern Corridor for the first time. 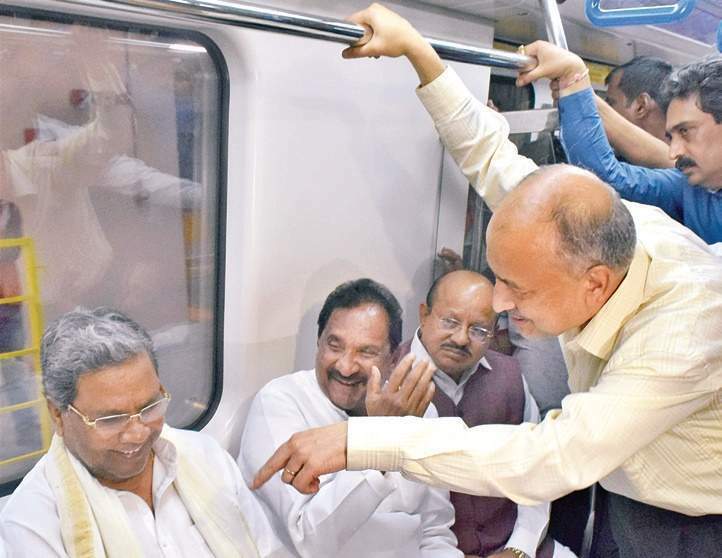 BENGALURU: For the second consecutive day, mediapersons waited for Chief Minister Siddaramaiah to address them at Nadaprabhu Kempe Gowda Metro station, but in vain. The chief minister came to the station and travelled by train, but left without granting the reporters an audience. Siddaramaiah was mobbed by TV camera crews inside the train and was almost on the verge of falling down once. On Wednesday, the Chief Minister’s office informed at the last minute that he would not be able to make it to the inspection. It was left to redfaced Metro officials to face the media and they took the group around the station for a second visit. The CM was on board a train on the Southern Corridor for the first time. It went from Kempe Gowda station to Rashtriya Vidyalaya Road and stopped for less than 30 seconds at K R Market and Chickpet stations.